Rites of passage are important in life - specially for academics who choose to forego the usual clear markers of time, such as between work and weekends, work and holy days. I write this message with thanks to Professor David Rowe and in celebration of his retirement — today. David has made joyous and generous contribution to the life of ICS. He is a generous soul, inviting others in a warm circle of humour. He is tireless in engagement, and energetic in working to make the Institute and the world around him a more congenial place. But let me also make a more formal acknowledgement of David's career. It should be said simply that Professor David Rowe is a major global figure in the fields of sociology of sport, cultural studies, and global studies. David's career contribution across the social sciences and humanities is major. He has been recognised by his 2014 election as a Fellow of the Australian Academy of the Humanities, followed by his 2016 election as a Fellow of the Academy of the Social Sciences. 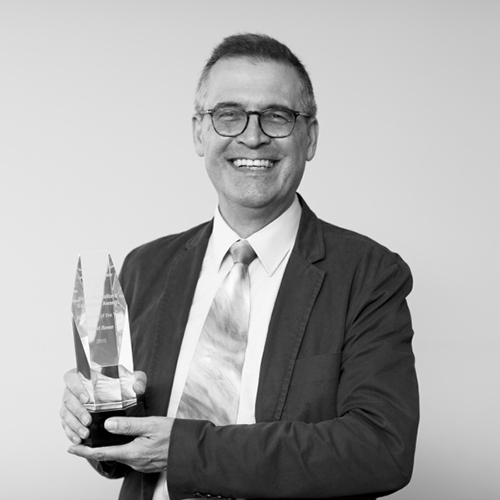 He won Western Sydney University’s 2015 Excellence in Research (Researcher of the Year) Award. He is an energetic, warm and supportive colleague, a mentor to many, and an inspiration to all. 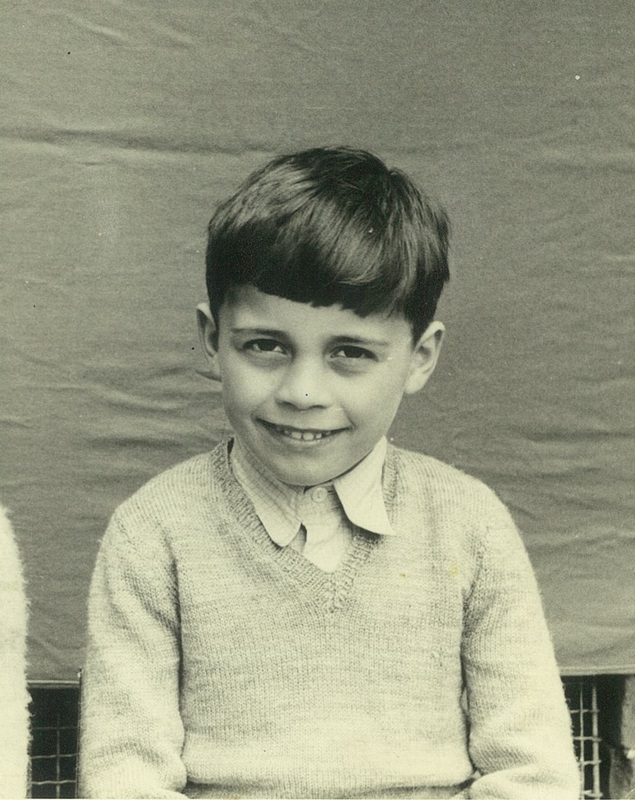 Above: A young David Rowe in his first year of school in England. David has made a sustained and globally recognised contribution to the interdisciplinary research fields of sociology and cultural studies. Through an integrated research program addressing the relationships between popular cultural texts and practices, socio-cultural institutions, and systems of power, his work on sport, national culture, media representation and globalisation has had a profound impact on scholarly thinking, both in Australia and internationally. Many scholars have taken up his work and used it to develop their own. This impact began with the early co-edited Power Play: Essays in the Sociology of Australian Sport (1986), reviewed in Leisure Studies (United Kingdom) as a ‘springboard for future research in Australia, and … for comparative cultural and leisure studies elsewhere’. I had the honour as an early career researcher in nationalism and globalism studies of being invited to contribute to that volume. Power Play was the first of a trilogy of successful books that helped open up the field of sport and leisure studies in Australia — the other co-edited works being Sport and Leisure: Trends in Australian Popular Culture (1990) and Tourism, Leisure, Sport: Critical Perspectives (1998). I was a young and naive tutor at Melbourne University at the time - and David treated me as if I was a normal academic. I put it down to my mailing address which gave the impression that I had a proper job. These books challenged conservative nationalist mythologies which tended to use sport and other forms of popular culture as simple confirmations of being Australian, and I read them avidly. 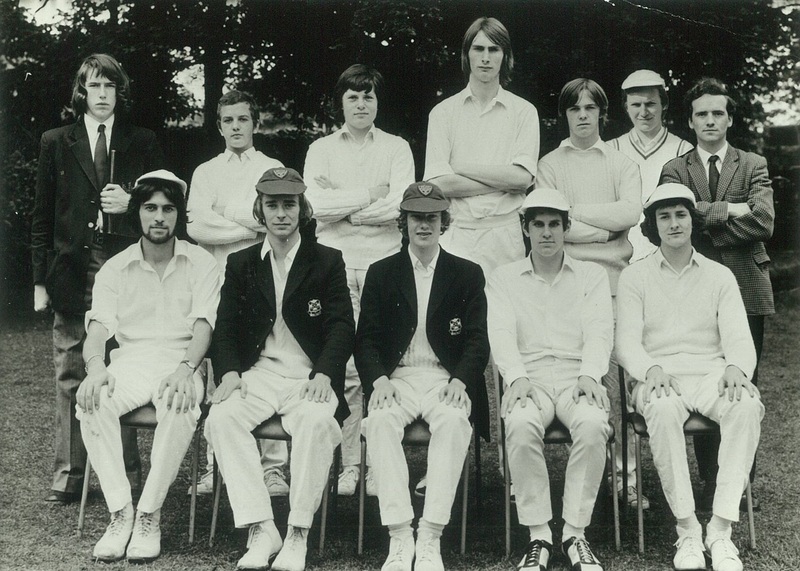 Above: David Rowe (bottom far-left) part of his school's cricket team, 1972. David was among the first scholars in the field to engage critically and sceptically with globalisation theory. A series of authored books (derived from several Australian Research Council projects) have had an agenda-setting, international impact on this field, including Popular Cultures: Rock Music, Sport and the Politics of Pleasure (1995, reprinted in 1996). This was followed by his best-known sole-authored book Sport, Culture and the Media: The Unruly Trinity (1999, 2004, 2006, 2013). Other books included Globalization and Sport: Playing the World (co-authored, 2001); Global Media Sport: Flows, Forms and Futures (2011, with 84 Google Scholar citations); and Sport Beyond Television: The Internet, Digital Media and the Rise of Networked Media Sport (co-authored, 2012). These monographs have been supplemented by three edited works that have drawn other scholars into this research domain: Critical Readings: Sport, Culture and the Media (2004); Digital Media Sport: Technology, Power and Culture in the Network Society (co-edited, 2013) and Sport, Public Broadcasting, and Cultural Citizenship: Signal Lost? (co-edited 2014). It is notable that all the monographs and anthologies that David has sole or co-authored/edited have been published in both hardback and paperback format (apart from two that were paperback only). This is clear evidence that they have found substantial readerships. This work has registered influentially across the international research field. For example, a challenge to critical orthodoxy, ‘Sport and the Repudiation of the Global’ in International Review for the Sociology of Sport (2003), has been anthologised, and was the subject of a specific response by David Andrews and George Ritzer (2007), who open their article with the statement ‘It is the responsibility of any true intellectual leader to challenge, provoke, and stimulate debate, which is something David unquestionably achieved in his article’. They describe their ‘critical engagement [as] the sincerest form of intellectual flattery’ (‘The Grobal in the Sporting Glocal’, Global Networks, p. 207). 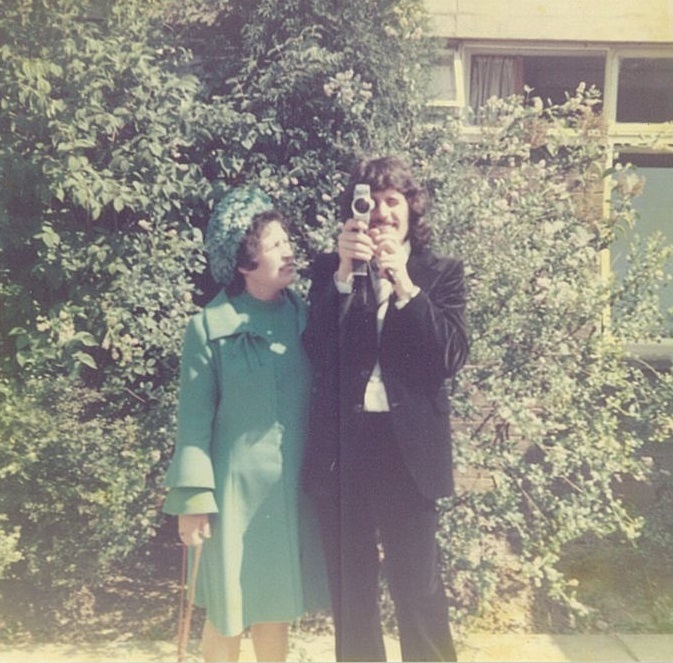 Above: David Rowe and his mother Jean at his undergraduate graduation at the University of Nottingham, 1976. In particular, David's research has made a major contribution to the socio-cultural analysis of an influential concept that he has developed — ‘the media sports cultural complex’. This has been the master concept of articles produced by others in the research field — for example, Scherer et al’s ‘The Media Sports Cultural Complex: Local-Global Disjuncture in New Zealand/Aotearoa’ (2008, Journal of Sport and Social Issues) and Phillips et al’s ‘The Media Sport Cultural Complex: Football and Fan Resistance in Australia’, in the edited reference work Political Economy of Sport (2005). David's research on the socio-cultural dimensions of media and sport has articulated with his wider work on the politics of culture. He has researched and published in a series of allied areas, including popular music (the subject of his doctoral research), journalism, cultural policy and planning, the night-time economy, arts and cultural practice, and Australian cultural industry and taste. This research has been supported by the ten Australian Research Council grants on which he has been a sole or co-Chief Investigator, and a range of other external and internal research funding. It has included his being an Australia-based representative of an 11-nation comparative survey, and content analysis-based project on media systems and informed citizenship, and on two international surveys of the sports press. 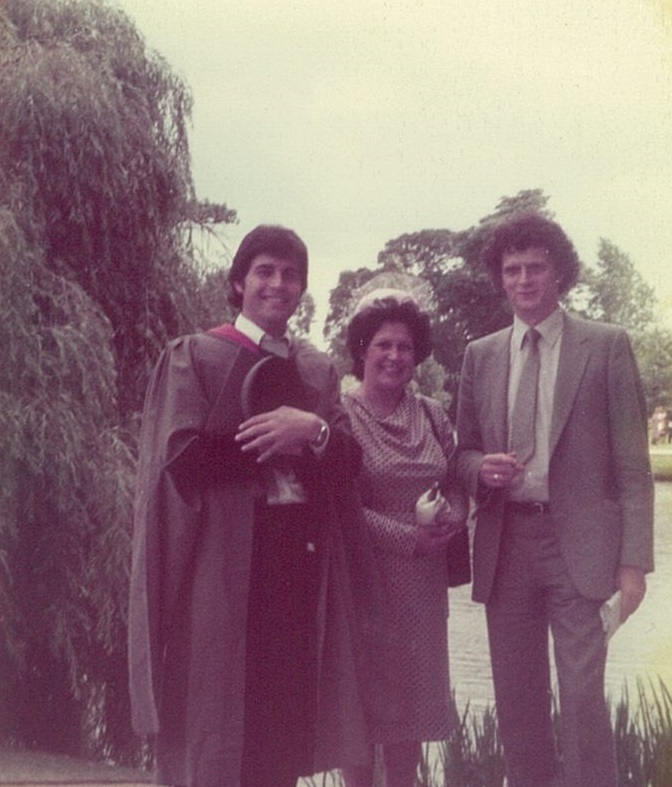 Above: David Rowe with his parent's Jean and Ken at his Master's graduation at the University of York, 1978. He has engaged in research consultancies applying interdisciplinary expertise in social, cultural and media knowledge fields (several by competitive tender) for a range of public and private organisations, including the Commonwealth Department of Transport and Regional Services; Maitland, Lake Macquarie, Newcastle, Parramatta and Sydney City Councils; Newcastle United (now Jets) Football Club; NSW Ministry of the Arts and Arts Upper Hunter; Play the Game (Denmark); Walkley Foundation, and the Communications Alliance. These projects produced major reports that have informed relevant policies and have normally been made available online for use by academic researchers and other interested parties, as well as feeding into new research and publication (for example, a pilot research in Parramatta’s night-time economy helped lay the foundation for an ARC Discovery Project). Examples of impact of these research consultancies and applied research, include the adoption of ‘Regional Tourism Cultural Plan for Maitland and Dungog’ funded by the Commonwealth Department of Transport and Regional Services as a model disseminated across regional Australia, his input into OPEN Sydney: Strategy and Action Plan 2013–2030, and his appointment as the Academic Member on the Steering Committee of the Cumulative Impact of Licensed Premises in NSW Project of the New South Wales Office of Liquor, Gaming and Racing, which produced a new policy for managing the density of alcohol licences in urban areas. David has also made several submissions to major policy inquiries, such as to the Department of Broadband, Communications and the Digital Economy’s Sport on Television: Review of the Anti-Siphoning Scheme (2009) and to the National Cultural Policy Discussion Paper (2012). David is regularly invited (and externally funded) to present at research conferences and symposia. He has been funded by the organisers to deliver keynote/senior scholar presentations at many major international research events including: 6th Annual Congress of the European College of Sport Science, German Sport University Cologne, Germany (2001); European Science Foundation Exploratory/Standing Committee for Social Sciences Workshop, Amsterdam, The Netherlands (2002); The Construction and Representation of the Global Sports Event Conference, Cambridge, UK (2003); International Sociology of Sport Association Pre-Olympic Scientific Congress, Thessaloniki, Greece (2004); The 4th International World Communication Conference on Sport and Society, Copenhagen, Denmark (2005); Korean Alliance for Health, Physical Education, Recreation and Dance International Sport Science Congress, Seoul, Korea (2006); Race, Sports and Globalism Symposium, Iowa, USA (2006); Asia Communication and Media Forum: Global Sports Events and Sports Communication, Beijing, China (2007); Sport in the City: Cultural Connections Symposium, Dunedin, New Zealand (2007); Global Sports Forum, Barcelona, Spain (2009); The Broadcast Education Association Research Symposium, Las Vegas, USA (2010); The 10th International Hamburg Symposium on Sport and Economics, Hamburg, Germany (2010); The East Asian Olympic Games: Media Strategies and Tactics Research Workshop, Beijing, China (2010); International Conference on Sports Media and Communication under Globalization, Chengdu Sport University, China (2011, 2015); Sport and Society in Transnational Contexts Conference, Zurich, Switzerland (2015); Sport and Diplomacy Colloquium, School of Oriental and African Studies, University of London (2015), and Golden Games: Sport and Diplomacy in East Asia and Beyond, Singapore (later in 2017). Phew! Exhausting to think of the travel required. 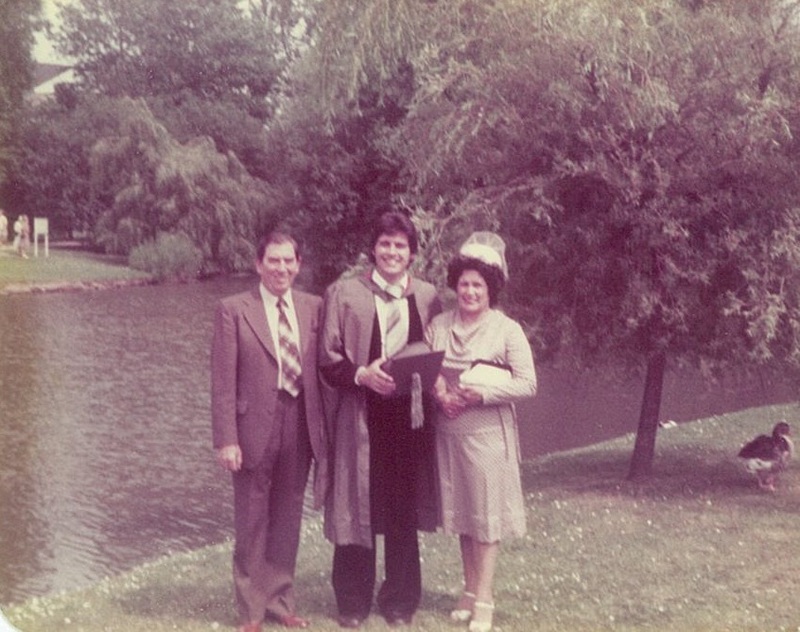 Above: David Rowe, his mother Jean, and his Master's supervisor, Professor Laurie Taylor, 1978. He is also regularly invited to present research papers at Australian and overseas universities, including Macquarie, Melbourne, Monash, Tasmania, Victoria and UTS (Australia), Bedfordshire, Brighton, Central Lancashire, Glasgow, Leeds Beckett, Roehampton, West of England. (UK), Loyola Marymount Los Angeles, NYU (USA), Alberta (Canada), Munich Technological (Germany), Linköping, Södertörn, Stockholm (Sweden), and Sungshin Women’s (Seoul). He has also been a Visiting Research Fellow/Visitor at several universities, including: Chelsea School Research Centre, University of Brighton, UK; TISCH School of the Arts, New York University, USA, and the Department of Media and Communications, Goldsmiths’ College, University of London, UK. More travel. These invitations have been stimulated by David's extensive peer-reviewed publications. To date, apart from his 12 books, he has given over 200 academic presentations in Australia and overseas. He has published or in-press 116 peer-reviewed articles in leading journals, including Journalism: Theory, Practice & Criticism, British Journal of Sociology, International Review for the Sociology of Sport, European Journal of Cultural Studies, International Journal of Cultural Policy, and Media, Culture & Society, and 95 book chapters for many of the most significant international publishers in his research field, including Sage, Routledge, Columbia University Press, Wiley-Blackwell, Palgrave Macmillan, Cambridge University Press and Elsevier. Several of his journal articles have been anthologised (sometimes revised and updated) in major works, including Sage’s Globalization and Culture Vol III (2009) alongside such leading researchers in the field as Arjun Appadurai, Roland Robertson, and Bryan S. Turner. David’s work has also been translated into several languages, including Chinese, French, Spanish, Turkish, Italian and Arabic. His internationally-oriented research program was conducted when he had considerable teaching, governance and administrative responsibilities, the former including the popular first-year Media, Culture and Society and third-year Popular Culture and Society units, and the latter including: Head, Department of Leisure and Tourism Studies (2000–2001); Deputy Dean, Faculty of Arts and Social Science (2001); Director, Cultural Institutions and Practices Research Centre (2000-2006) (The University of Newcastle), and Director and Professor, Centre for Cultural Research (2006-2009) (Western Sydney University). Since 2014 he has been Honorary Professor, Faculty of Humanities and Social Sciences, University of Bath, UK. 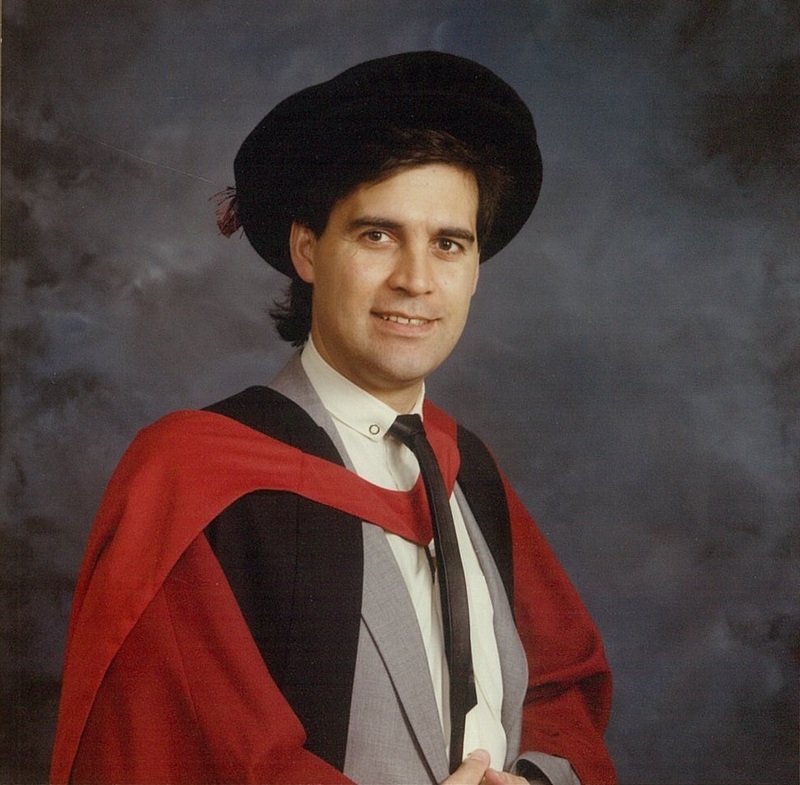 Above: David Rowe receiving his doctorate from the University of Essex, 1986. David’s dedication to research higher degree training education is evidenced by his supervision of 20 successful doctoral and one research masters (international) candidates. He has made several presentations to students on behalf of the Western Sydney University Graduate Research School, especially in the area of media sensitisation and training for graduate students. David provides significant professional service to his field of research and scholarship. A member of several professional associations (including International Association for Media and Communication Research, British and Australian Sociological Associations), he is a foundation Associate Editor of Communication and Sport (since 2013) and recently completed a three-year term on the editorial team of Journal of Sociology. He is on the editorial advisory boards of many journals, including Annals of Leisure Research, International Journal of Media & Cultural Politics, Feminist Media Studies, and International Journal of Sport Communication, and was appointed an Associate Board Member (2008–2010) of the leading journal Sociology (UK). He has co-edited several special issues, including ‘Interrogating Boundaries of “Race” and Ethnicity in Sport’, International Review for the Sociology of Sport (2010) and ‘Transforming Cultures? From Creative Nation to Creative Australia’, Media International Australia (2016), and has refereed for over 30 journals, including Television & New Media, International Journal of Cultural Studies, Society and Space, and European Journal of Cultural Studies. David evaluates book manuscripts and proposals for leading international research publishers, including Minnesota University Press, Sage, Cambridge University Press, McGraw Hill, New York University Press, Pearson, Oxford University Press, Routledge and Wiley-Blackwell. He is often commissioned to provide entries for authoritative reference works, including Encyclopedia of Television, Blackwell Encyclopedia of Sociology, International Encyclopedia of the Social and Behavioural Sciences, and Encyclopaedia Britannica, as well as major Handbooks and Companions published by Sage, Routledge and other leading publishers in his field. Above: Professor David Rowe receiving the Western Sydney University Research of the Year Award for 2016. David is a grant assessor for the Austria, Australia, Canada, Ireland and Qatar Research Councils, and for the Olympic Studies Centre of the International Olympic Committee (Switzerland) and Velux Fonden (Denmark). He is currently or has been on the Boards of several research Centres/Institutes, including: International Research Advisor, Centre for International Media Analysis, Research and Consultancy, University of Bedfordshire, UK (2001-15); Associate of the Australian Centre for Olympic Studies, University of Technology, Sydney (2006-13), and Member, International Advisory Board, International Research Institute for Sport Studies, University of Central Lancashire, UK (since 2009). He also assiduously disseminates research findings and promotes public discourse on a range of socio-cultural issues in national and international print, broadcast and online media through ‘op eds’ and interviews with a range of outlets, including The Sydney Morning Herald, Australian, Melbourne Age, Australian Financial Review, Guardian, Reuters, Online Opinion, regional radio stations in all Australian states and territories, ABC Radio National, and the BBC. Since December 2012, he has published 39 articles in The Conversation (opens in a new window), and has been interviewed as an expert in two other articles. He is also frequently invited to speak at public fora, such as Nike Sports Panel Debate (2015), Sport and the Sociological Imagination (2016), and Copyright Society of Australia Panel (2017), and in 2013 gave The Australian Sociological Association (TASA) 50th Anniversary Public Lecture at Parramatta Town Hall. I might seem that I have written a lot, but this only goes a short distance to recognising a magnificent academic life. And you can see why David did not maintain the distinction between working days and weekends as he might have done. Thanks, David, on behalf of all us at ICS.